As a child or teenager, braces are almost a rite of passage. On the other hand, as adults, dental patients facing the choice between misaligned teeth or traditional braces often have a much more challenging decision to make. While the goal may be to have a beautifully aligned smile, the idea of smiling through metal braces is intimidating. Patients of Dr. Vickii Bingham-Lester in Gambrills, MD, often ask, “How effective are Invisalign braces?” Individuals are intrigued by the concept but want to be sure the investment will pay off with a beautiful smile. Dr. Bingham-Lester and her team have helped countless patients improve their smiles with Invisalign orthodontic treatment. 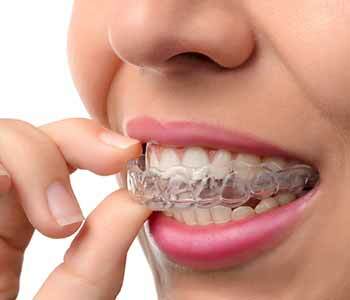 Invisalign uses clear alignment trays to gently shift the teeth into their proper alignment. Each tray is worn for two weeks, and then the patient moves to the next tray in the series. The most well-known benefit of Invisalign is the clear alignment trays that make the treatment nearly unnoticeable. However, there are additional benefits as well. For example, because the trays can be removed, patients can still eat their favorite foods and can take better care of their teeth by removing the trays for brushing. Furthermore, the trays are made of thin, smooth plastic which is more comfortable than the sharp brackets and wires, and small rubber bands that snap and hurt the inside of the mouth. Instead of visiting the orthodontist to have the wires tightened every four weeks, patients only need to visit the dentist several times over the course of treatment to ensure that the progress is on track. While Invisalign does not work for every single patient, it is effective for those patients whose teeth are not severely misaligned and those who will stick to the treatment plan. While the trays can be removed, they can’t be effective if they’re sitting on your bathroom counter. So be sure to wear them except when eating or brushing and you’ll soon have a smile you can be proud of. For more information about Invisalign, call 410-885-6522.